Description: A delicate floral design is captured in Statuario Idalight is featured on this stunning Gilded Tobacco finished wall sconce with a curved profile. The design is the logo of Country Inn & Suites. The ADA compliant wall fixture is illuminated with customer-supplied, high quality LEDs for robust illumination, energy savings, minimum maintenance and long life. This sconce is custom crafted in our manufacturing facility in the USA. 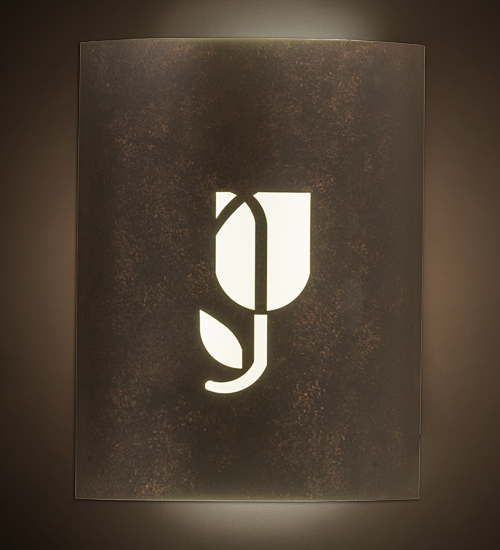 We can custom design lighting fixtures using any artwork, concept, logo or design. Custom sizes and dimmable lamping options are also available. UL and cUL listed for dry and damp locations.